I was working on writing my reflection on the past ten years of life in a post-9/11 world reality. This entire week is devoted to all sorts of memorials and special segments on T.V. regarding all the emotions and information surrounding 9/11. Rightly its an immense historical event, its shaped this country and fundamentally changed us all as Americans. I mourn. I remember. I reflect. Like all Americans, and conscientious people around the world, the 10 year anniversary is a significant milestone. I wrote significant pieces over the past ten years reflecting on what all this means to me, process out the feelings and the reality. This year, probably nothing astounding or worth reading, I decided to reflect on how I have been trying to not focus on wearing my religious identity on my sleeve in my new life as a law student. I reflect on how I am forced by the events happening around the world to become a “token Muslim.” I guess the conclusion is that its unavoidable and that its an incredible challenge moving forward. Islam and Muslims have become intricately woven into the American consciousness and with globalization and economic competition this reality won’t change. 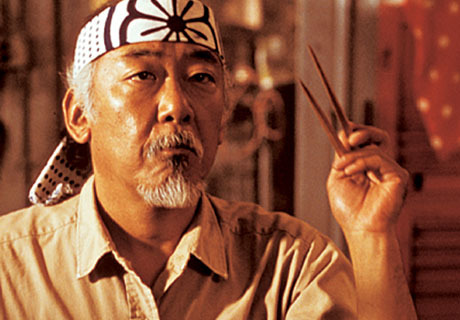 Cutting to the short of it, I basically found myself struggling to think about historical “tokenism”, which immediately made me think of Mr. Miyagi (reclaiming Mr. Miyagi, cultural context and beef with Mr. Miyagi). It helped that I was listening to a song where the lyrics for “Look at me now” by Chris Brown- “She wax it all off, Mr. Miyagi”—sigh, still being abused and used. Does wearing your religion on your sleeve cloud your logic exerting abilities? Where’s the connection?